We ordered 11 (eleven) items. We used to go to Vogue quite often when they first opened. The restaurant filled a void in our world. 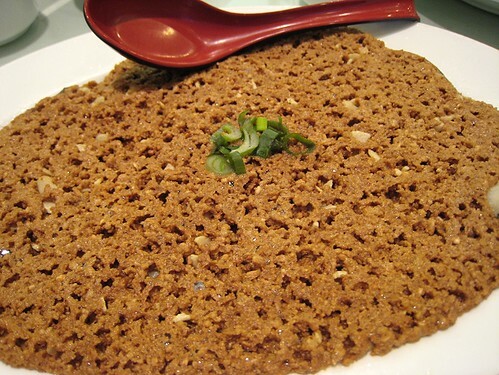 Prior to Vogue opening, the Taiwanese food that we used to go were primarily "small-eats" (xiao chr) restaurants, serving primarily noodle bowls and what we call "rice with topping" dishes (e.g. fried chicken leg with rice, minced pork sauce with rice, and so on). Vogue was the only restaurant somewhat near to us that served Taiwanese fare other than the small-eats. 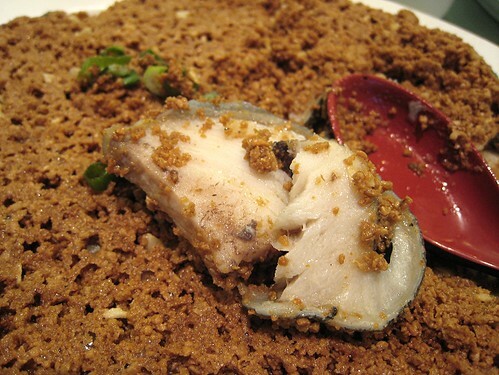 Not to say that Vogue food is Taiwanese fine dining, because it is not. The food they serve is more home-cooking rather than fine. Vogue fell out of our restaurant rotation a couple of years ago, after a couple of mediocre dinners. When we had relatives visiting from out-of-town, we alighted here and I personally was disappointed by the food. By chance, many of the dishes that fateful night we also ordered this time, after our hiatus of more than a year. Saturday rolled along and feeling too lazy to cook dinner that night, we decided to head on out. You must realize that going out to dinner for us is no small feat. First, there are 9 of us invading the restaurant, 3 of those are small children. Our group composition eliminates a LOT of restaurants. Two of our beloved small children have trouble sitting still for a couple of hours. Then, of course, there is the problem of all of us agreeing on the type of food we want to have that particular moment. Of our LIMITED choices in restaurants, those that can accommodate us are Chinese, Japanese, and a few other ethnic Asian restaurants. Western restaurants -- those that are not CHAINS (aka those that do not serve crappy food)-- are out of the question. Because we like to make it harder on ourselves, we NEVER PLAN IN ADVANCE that we are going to eat out on a particular day. This Saturday, around 5 in the afternoon, we were STILL deciding where to eat. And lest you think that our decision-making process is some kind of concerted effort, kind of like Parliament or a board meeting where everybody sits together and discusses the problem at hand -- it is not. Our concensus-building process meanders and meanders and meanders, with people drifting in, usually, unhelpfully, to disagree, then drifting out again of the conversation. I guess it is only by pure luck that, when we called Vogue at around 6 in the evening, they said they will take our reservation for 9 people, for 7:30 that night. Ordering was left to yours truly. Since our beloved small children were getting hungry (or were already very hungry), I had to whiz through the menu and just picked dishes randomly, trying to order "kid-friendly" dishes. 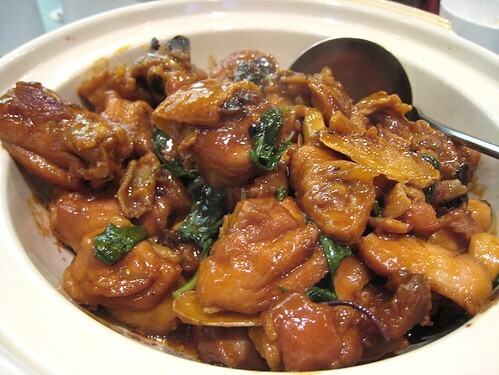 3-Cup Chicken (san bei ji) is one of Vogue's signature dishes. 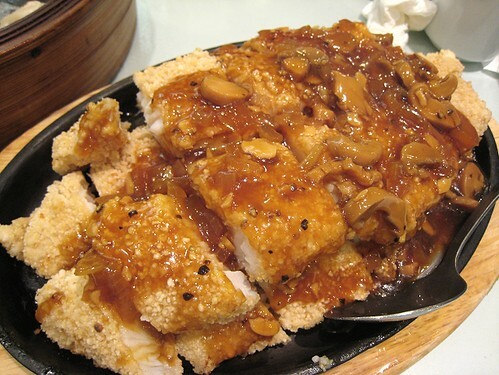 Whenever we go to a Taiwanese restaurant, we always order 3-cup chicken as this is one of Taiwan's best-known dishes. I remembered Vogue's 3-cup chicken to be very, very good, perhaps one of the best that I've ever had, when I tried theirs long, long time ago. This time, I didn't quite like it as much. The sauce was too sticky for my taste and it was over to the sweet side. I remembered the previous 3-cup chicken to be very balanced, with the sweetness of the soy sauce balanced with the slight "smokiness" from the sesame oil, with the right acidic touches, and fragrant, fragrant notes of the sauteed ginger -- and the kicker, the Asian basil. This dish today pales in comparison to the 3-cup chicken of yore. One thing we didn't order was another signature dish, the Spicy Pork Organ Stew. Well, the dish isn't exactly "kid-friendly." Not only that, but in our family, it wasn't very adult-friendly either. The only people who were going to eat the pork organ stew, had I ordered it, would be me and my father. I regretted not ordering the pork organ stew though: not only do I remember it as quite delicious, but I fear losing my "street cred" by sticking to safer dishes. I love green onion pancakes. 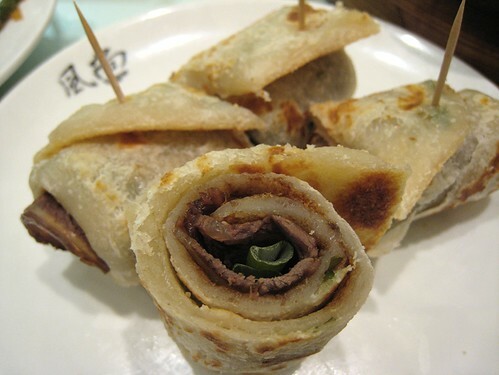 I ordered this version, with the beef rolled up inside with some hoisin sauce, because I thought the children would like it better. I thought this was a passable version (a tad too dry but too little lubricating hoisin sauce inside), but I wished I had ordered the green onion pancakes plain. I didn't try this because I knew it would have hoisin inside. I usually like hoisin only sparingly, and from my experience, these beef roll-ups are too hoisin-y for me. I would've eaten plain green onion pancakes. 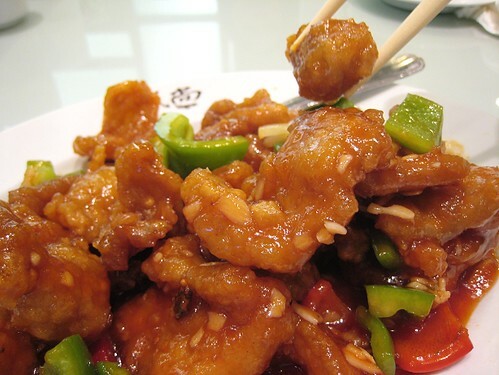 The above was Sweet and Sour Pork. Not bad. (Since I'm Chinese, "not bad" means "OK/edging towards good", haha.) It wasn't horrible like in other places where the pork would be all mushy and the sauce a terrifying red. So yeah, not bad at all. This was shrimp with pineapples. I forget the exact name as it appears on the menu, but it's supposed to be a "Taiwanese kid favorite". I like these mayo-based dishes well enough. I finished off those pineapple pieces, I think. Okay. Could be better. Not really a fan of this dish. 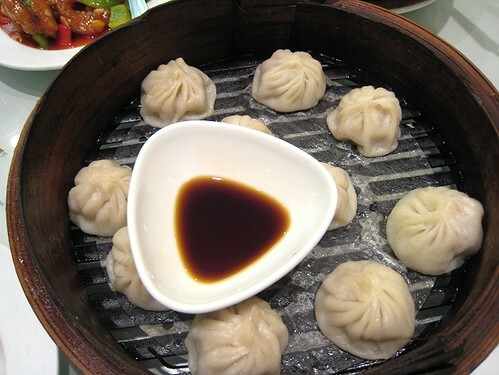 "Small Dragon Bun", of course, more famously known as "xiao long bao". I'm not much of a dumpling person, so I didn't actually eat this. According to our dumpling expert (haha), these were "OK", but not that good. He prefers the xiao long bao at Shanghai River. This dish is called Sizzling Fish Fillets in Black Pepper Sauce. Or something close to that. (I don't remember if they identified the fish as "basa," a very thick, meaty, white-fleshed fish, as you can see from the picture). This was one of the dishes we ordered the last time we went to Vogue and I remembered it as a spectacular failure. I was hesitant to try this because of the memory of soggy, goopy batter and muddy-tasting fish. This time, the batter held up quite nicely: the fish fillets were crisp and clean. The black pepper sauce could have been a touch more peppery for my taste. The strange looking thing on the left is actually a fish dish. Cod with Roasted Bean Topping. I remember liking this better before. Or perhaps the bean topping was blander compared to the dishes I was eating. Not too sure. It was OK. The "Hakka Mix" above was the pleasant surprise in this array of dishes. I don't recall having ordered this dish before, but TS insisted that we order this, and I'm glad we did! This is similar to what I think of "chop suey" as, a-throw-things-in-wok-and-stirfy type of dish. The "mix" was firm tofu strips, pork slivers, Chinese celery, green onions, basil, squid (that might have been dried already), a tiny bit of chili peppers, garlic, and Asian basil. The final product was a very interesting, multi-faceted dish, delicious in the layers of flavours and the differences in texture. I highly recommend this "Hakka Mix" and will be ordering this dish from here on end. 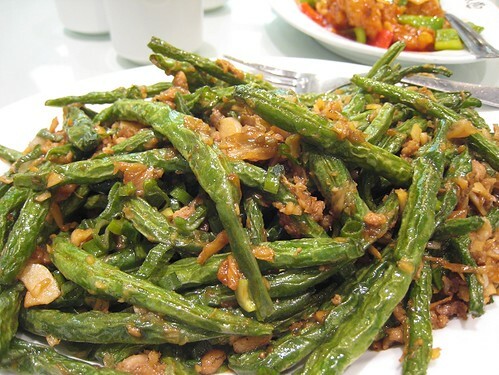 Sichuan Green Beans. 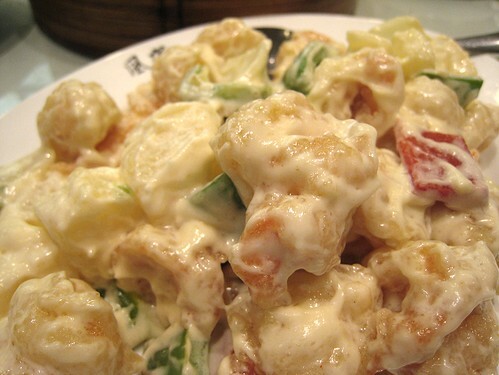 This dish or any of its variations is a regular for us when eating at Chinese restaurants. How can one not like it?! This Vogue version was good. Sliced Pork with Garlic Sauce. Mmmm! This is a FAVORITE dish of mine. This was good, although the sauce was a touch sweet. I would've preferred it to be more garlicky. Like, über-garlicky. But that's just me. Like black pepper, garlic is a "neutral" taste for me. Another winner of a dish. This dish would be under vegetable dishes and it's just called "seasonal greens." You can pick and choose what type of greens you like. 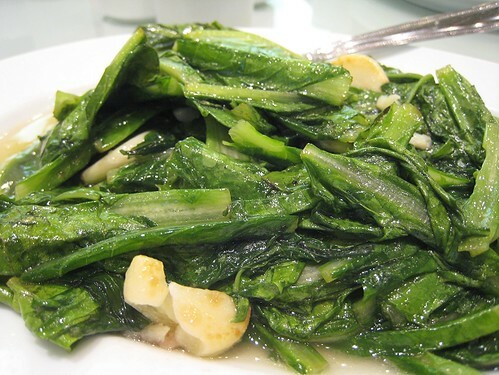 Usually, it's a choice between pea shoots, water spinach, and this vegetable, which is called "A-tsay" (translated "A-vegetable"). 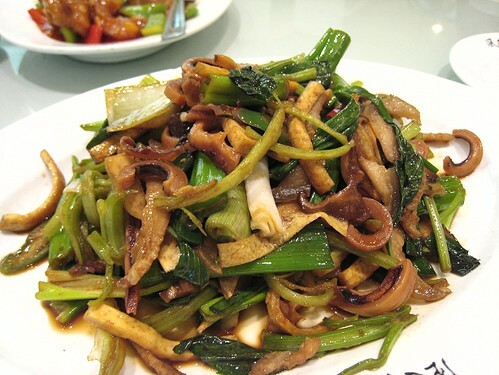 I really don't know how Chinese restaurants succeed in doing vegetables so well. As far as I can tell, these veggies are just stirfied in oil and garlic, but it just tastes so darn delicious. We can never imitate this at home. This dish was gobbled up, even by family members who are not very "vegetable-inclined." Just goes to show that vegetables are delicious, if they are prepared correctly. Yes, my favorite dish out of this whole meal was this vegetable dish! Who would've thunk it. It was just so simple, so good, and as JS mentioned, something we can never do at home. I think this A-tsay may be called Taiwanese romaine? With the amount of food we got, I was surprised that we got out of there at $15 per person. I guess Vogue is back into our restaurant rotation now? Next time, we will plan in advance and we'll call them for reservations at least a couple of hours in advance. Yes, Vogue is definitely back in our limited restaurant-that-can-accomodate-all-of-us repertoire.